The number of international students working in the U.S. after graduation through the Optional Practical Training (OPT) portion of their student visa has grown more than 300% in the last 12 years, surpassing the annual number of H-1B visas issued to private sector employers. The nature and impact of these two sources of high-skilled talent were the subject of WE Global’s July 24 webinar with Neil Ruiz, Associate Director of Global Migration and Demography at the Pew Research Center. 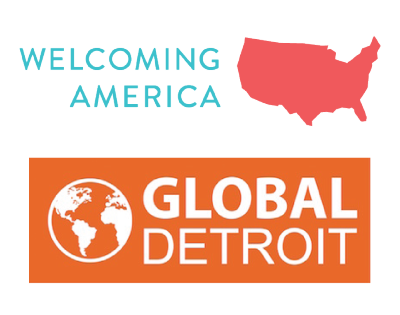 Attended by some 60 WE Global members, nonprofit organizations, workforce development agencies, chambers of commerce, national advocacy organizations, universities, researchers, and economic development leaders, the webinar is now available on the WE Global website here. While the Trump Administration has begun to implement rules that impact both the OPT and H-1B programs, especially for third-party staffing firms, the Pew research documents that these programs have helped American companies compete by providing hundreds of thousands of workers every year in fields where labor demands are high. Salaries for these workers are largely competitive for these fields. 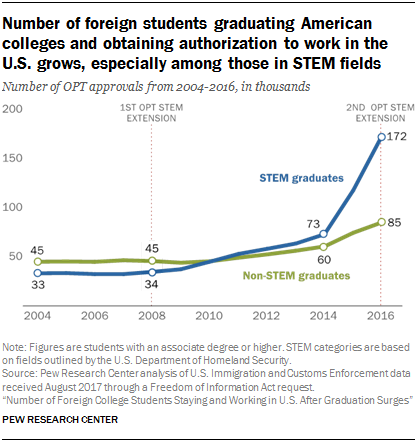 And while national debates on immigration policy rage on, the Pew research highlights that companies across the Midwest and nation are finding new ways to meet unmet talent needs by engaging international students and using the H-1B visa program. The research shows that the growth in international students working on OPT was largely driven by a 400% growth in the number of science, technology, engineering, and mathematics (STEM) majors using the program after graduation. Most of the growth happened with graduate degree holders. The growth in OPT usage was significantly impacted by the creation of a “STEM-extension” under President George W. Bush in 2008 and its expansion under President Obama in 2016. There are now more international students entering the U.S. workforce on any given year through the OPT program than H-1B skilled immigrant workers. Pew has created an interactive site that enables one to search by metro region to determine the retention, inflow, and outflow of international students working on their OPT. While the WE Global region has some of the world’s leading research universities and tremendous international student populations, many of the metros—including Cleveland, Pittsburgh, and St. Louis—experience low retention and large outflows of international talent. But the story is mixed and the data can provide a very nuanced and detailed picture. The data can be accessed here. For smaller metros that do not appear on the Pew website, Neil has offered to provide the information directly. Neil’s research at Pew also recently developed an analysis of where H-1B skilled visa workers work across America. While several Midwest metros rely on H-1B workers to plug unfilled skilled – especially STEM – worker demands among local employers, the highest density use of the H-1B visa tended to cluster on the coasts and Texas. 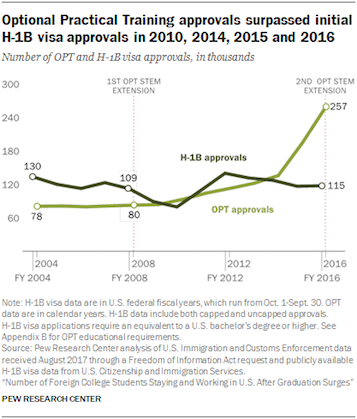 The Pew research analyzes the total number of H-1B approvals by metro over a 16-year period, the percentage of a regional workforce that H-1B workers comprise, average salaries, and the percentage of H-1B workers with advanced degrees, as well as advanced degrees from U.S. universities. This research can be found here.